New York Fashion photographer Jodi Jones has teamed up with Phase One and Profoto to offer an exciting and unique opportunity to learn how to create beautiful images and take your business to the next level! 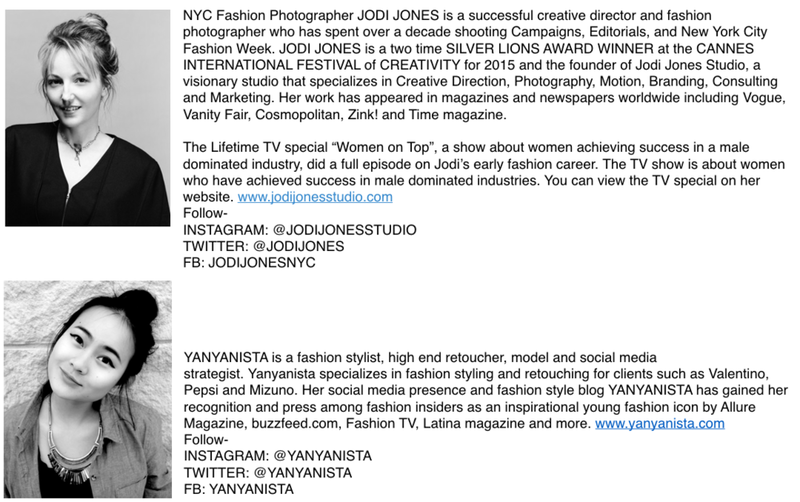 Jodi and NY Fashion Stylist, Yanyanista, are offering an exciting and unique opportunity to learn the real nuts of bolts of the fashion industry, taking you from any level to the pro level. Jodi and her team of experts will show you ways to dramatically grow your portfolio and learn creative retouching, marketing, and social media techniques. This intimate workshop will have you working with and learning from a top crew and models, and will give you an excellent opportunity to network. In this MASTER CLASS program, you will learn every stage of a fashion shoot from: creative concepts, fashion styling, casting the models and crew, shoot prep, shooting in-studio, shooting on-location, lighting techniques, model direction/poses, shooting tethered, post production and retouching. 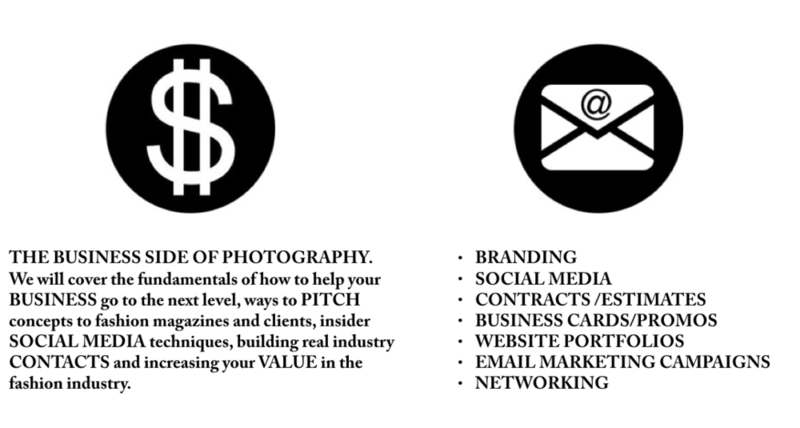 Plus a wealth of business information including pitching clients, marketing, and social media advertising. A Capture One expert will give an in-depth teaching of how to create an efficient workflow using the software. DAY 1 MORNING - Throughout the weekend we will find THE NUTS OF BOLTS OF FASHION PHOTOGRAPHY. In the morning on day 1, we will cover studio lighting, creating moodboards, posing the model, and creative direction in a keynote presentation. There will be a group Q&A session with my team, including the lead fashion stylist, Yanyanista, who will go over the concept and inspiration for the afternoon shooting sessions. DAY 1 AFTERNOON - After breaking for lunch, we will then regroup and everyone will have the opportunity to shoot in the studio with the Phase One medium format camera system and lenses and our professional agency models in a gorgeous set up for your portfolio. I will be teaching you all my essential lighting techniques that I use in my work. I will show you how I approach the creative process of making an image along with the technical knowledge needed to be confident in your technique. DAY 2 MORNING - We will start up on day two with an overview of the day before, a retouching segment with Yanyanista, my personal retoucher. She will be uncovering tricks of the trade and sharing before and afters. A Capture One expert will follow with an in-depth teaching of how to create an efficient workflow using the software. DAY 2 AFTERNOON - After lunch, the second portion of the day will be a group portfolio review where you have the opportunity to find out what image(s) of yours are the most powerful to help move your career forward. We will then cover essential business and marketing strategies for getting your work published, pitching to clients, social media tips and strategies. In this segment, with a set of new ideas and a marketing strategy, I hope to give you a plan that will elevate your business to the next level! At the end of the second day you will also have the option of attending a wrap dinner with myself and a few members of my team to extend the conversation of the workshop and get to know each other over dinner & drinks! We encourage networking during the workshop and many students leave with new connections in the industry. Availability: There will be a limit of 15 students for this event. Equipment provided: Phase One medium format digital camera and lenses. Equipment requested that you bring: 2 compact flash memory cards, laptop, tablet (or mouse), and your portfolio (whether printed, presented on an iPad or laptop). Investment: $800 USD (please pay deposit or in full). Includes a light lunch and refreshments each day. Does not include flight, accommodation or transportation. Optional: Join Jodi and her team for dinner where she extends the conversation from the workshop during a fun and casual evening. Payment Terms: Please note that a 50% deposit is required to reserve your spot. The rest of the payment is due 3 weeks before the workshop event start date. Cancellations: We have a 3 week window cancellation policy. If you cancel your enrollment in a workshop more than 3 weeks before the course start date, we will refund your deposit. After this, the deposit is non-refundable. If you are uncertain you will be able to attend the course, please let us know in advance. JODI ALSO TEACHES ONE-ON-ONE PRIVATE LESSONS. A Guide to Beauty & Fashion Lighting by Jodi Jones.This Ebook will guide you through lighting all your fashion and beauty shoots! It shows examples of my work and detailed lighting diagrams on where I placed the light, what modifiers I used, and why! Use this guide book as a way to think about light and how it relates to mood, tone, emotion, feelings and style! This Ebook is a value-packed read that won’t waste your time! Get inspiring photos, instructions, and diagrams! Refer to this Ebook often during your step-by-step process to create stunning images! If you truly do not want to change your photos then do not read it, but if you do, you must read it! Get a copy of the new ebook on lighting! Click here!